Background image of Aerial view of a small wooded island in the midst of still blue water with wisps of clouds. Northern British Columbia. Maps have always been at the heart of Ecotrust’s work to better connect people to the places they live. Over the years, we have built hundreds of maps that illustrate important physical characteristics of our landscapes, as well as cultural values and vulnerabilities of the places we live. Here is a sampling of our most significant maps over the last two decades — from 1991 to 2014. More are at Inforain.org. This map of the largest unlogged watershed on the West Coast set the stage for a major protection campaign by the Haisla, Ecotrust and local and international partners. In 1994, British Columbia protected the area as the Kitlope Heritage Conservancy. In the early 1990s, Ecotrust founder Spencer Beebe and colleagues began mapping the world’s rare coastal temperate rain forests. They found that nearly 50 percent of the original forest (Pacific Northwest historical forest is dark green, above) had been lost. But the biggest stand left was in the Pacific Northwest, stretching from northern California to Southeast Alaska. 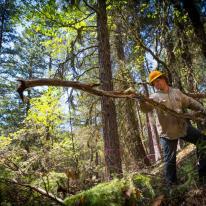 A native Oregonian, Beebe turned his focus from foreign lands to “the rain forests of home.” Ecotrust would be the vehicle for this new regionally focused work. Willapa Bay supplies much of the Northwest’s oysters; Ecotrust mapped the key cultural and ecological characteristics of the area — including the important oddity of privately owned tidelands — as part of outreach efforts there. 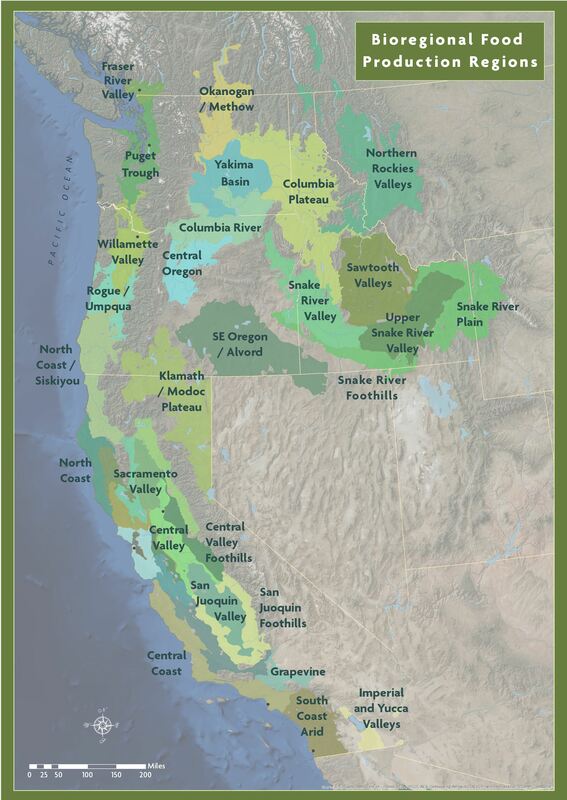 Placing Ecotrust’s maps of native language loss, forest cover loss and salmon species loss shows an unmistakable pattern of interconnectedness between humans and ecosystems. In 1998 we also created the first-ever comprehensive view of North Pacific salmon stocks brought together data from a bevy of public agencies, and tracked salmon health across all of the region’s medium-sized watersheds. This marked Ecotrust’s entry into marine spatial planning. 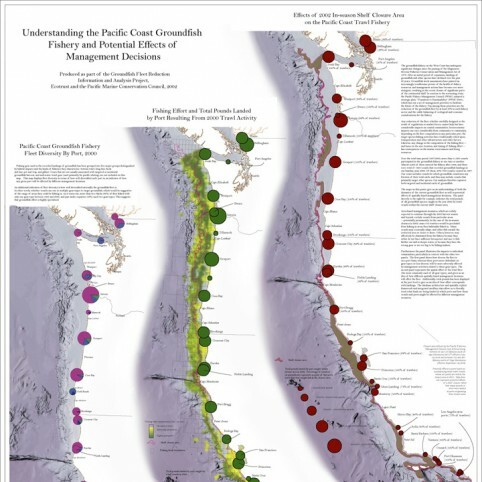 When the Pacific Fisheries Management Council announced a closure of groundfishing in 2002, Ecotrust was able to map out the uneven economic effects of that closure on West Coast ports and fishermen. The maps demonstrated the value of spatial analysis in fully understanding the consequences of ocean management decisions. 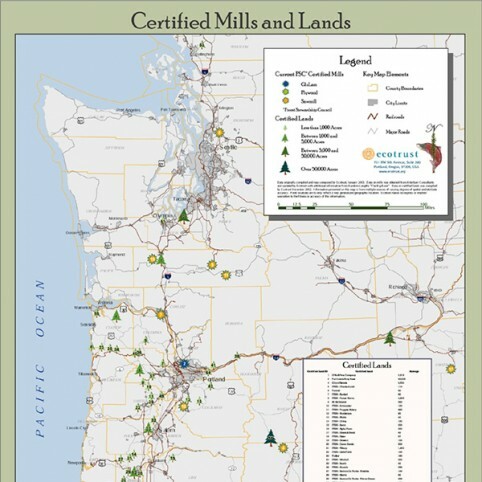 The first map of its kind allowed Northwest timberland owners considering Forest Stewardship Council certification to gauge the cost of getting their product to market, via certified mills. 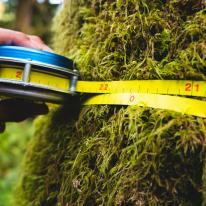 Ecotrust has since invested considerable resources expanding FSC-certified timber supply and mill capacity. This continued our efforts to chart important watersheds and assess the work needed to protect and restore their health. 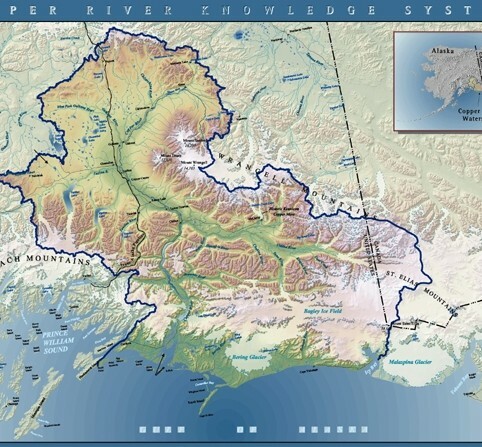 Ecotrust built a living catalog of Copper River knowledge and helped establish Alaska’s first inter-tribal conservation district to co-manage the river. 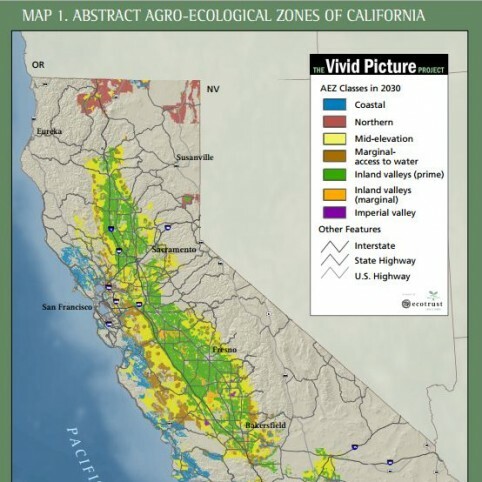 Inventing a new way of looking at agricultural zones, our maps for the Vivid Picture project in California used a mix of environmental and cultural factors to classify growing regions in the state. Leveraging this new map, we analyzed the future effects of climate change and water policy. Taking our bioregional cartography to a global scale, we built a catalog of regions around local similarities in environmental and cultural factors — language, precipiation, vegetation, among others — in an attempt to remap the world. 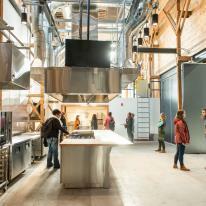 This approach allows communities and regions to re-envision how they operate. 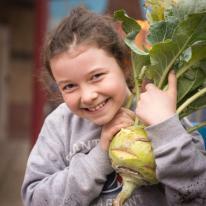 We established new agricultural zones based on environmental and human factors. As we begin to model climate change across the region, this mapping system will help us understand how factors like temperature or water will be affected in each of our zones. Maps made possible with generous support from ESRI.